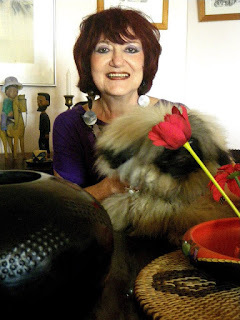 Durban artist Fiona Kirkwood has reported on Facebook that Jill Addleson, former Durban Art Gallery director, died on August 18, 2018. (She was born on August 9, 1943). “It is with great sadness that I share this news about the death of Jill Addleson. Jill, courageous and uncomplaining until the end died at 4.30 am this morning of cancer. “Her final days in hospital were spent surrounded by beautiful colourful flowers. Jill had a passion for colour. “Jill Addleson played a huge role in the lives and works of many artists and craftspeople in KwaZulu-Natal and she influenced the lives of artists all over South Africa and also internationally. As a past director of Durban Art Gallery and thereafter Curator of Collections at DAG, Jill will be remembered by many who knew her as a very vibrant, colourful, dramatic personality, always interestingly attired, accompanied by one of her Pekinese dogs. Jill leaves her brother Steven and sister-in-law Ros, niece Gina and nephew Oliver. “May you rest in peace dear Jill forever surrounded by beauty,” adds Kirkwood. The funeral will be held tomorrow (August 20, 2018) at 12h00 noon at the Jewish Section of Redhill Cemetery in Durban.